What is the Visor Neo? As the definition above indicates, the Visor Neo is a new version of the original Visor Deluxe. Sometimes the correlation between Handspring and Apple are scary. Apple introduces the iMac, then every once in a while gives it new colors and better hardware. In 1999, Handspring introduces the Visor, and now has given it new colors and better hardware. Coincidence? I think not. The Visor Neo is essentially a Visor Pro-Lite. Since that is a poor oxymoron, Handspring had to give it a different name. 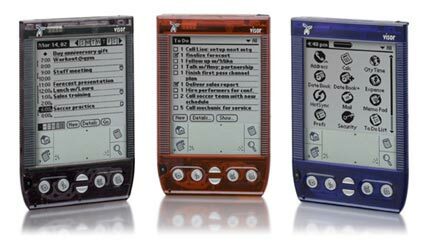 The Neo has the standard Visor form factor with a more powerful 33 MHz Dragonball VZ processor, 4-bit (16 shades of gray) monochrome screen, and Palm OS 3.5.2H3. Instead of the bright translucent colors of the Visor Deluxe, the Visor Neo has more subdued colors that are not as easy to see through. The blue model that I reviewed was a very deep blue -- almost purple. The Visor Neo comes with all of the features of Palm OS 3.5, which includes features like Ir synching and 4-bit grayscale support. The Fast Lookup feature that was introduced in the Visor Edge is also here. Fast Lookup allows users to quickly find a contact in the Address Book by using the Visor's hardware buttons. See the Visor Edge review for full details on how it works. Size: 4.8" x 3.0" x 0.7"